Brown’s father has called for protests to be halted for the day. Michael Brown's mother, second from left speaking at Peace Fest yesterday. THE FUNERAL SERVICE FOR 18-year-old Michael Brown shot dead by police officer in Ferguson, Missouri have has begun in St. Louis. Brown’s great uncle, pastor Charles Ewing, is to deliver the eulogy at Friendly Temple Missionary Baptist Church with Rev. Al Sharpton also expected to speak. Brown’s killing exposed racial tension and failures of aggressive policing that manifested itself in protests and violence, propelling the small town into the international spotlight. Ahead of the funeral, Brown’s father Michael Brown Sr. called for protests to be halted for the day and observe a “day of silence” so the family can grieve. Hundreds of people have lined up in sweltering heat to pay their respects to Brown with a steady stream of people filing into the church. President Barack Obama has also sent three three White House aides to the church in St. Louis with other notable attendees including Martin Luther King III, the Rev Jesse Jackson, families of Trayvon Martin and Sean Bell, director Spike Lee and musicians Sean Combs and Snoop Lion. The funeral service is being carried live by several US networks and being streamed online by a variety of outlets. More than an hour before Brown’s funeral was to begin, a steady stream of people started filing into the church. Among them was Will Acklin, a black man from Little Rock, Arkansas. Angela Pierre, a machine operator who once lived in Ferguson, where the shooting happened, said she hopes the funeral helps turn a page and eases tensions. Most important, though, she hopes it provides healing for Brown’s family. The church’s sanctuary, which seats about 2,500, was filling quickly. Two poster-sized photos of Brown were near the casket, along with another photo of him as a small child. Brown’s father has asked protesters to take a break Monday and observe a “day of silence” so the family can grieve. Early Monday morning, Brown’s request appeared to be honoured. At the Ferguson Police Department, where a small but steady group of protesters have stood vigil for two weeks, a handmade sign announced a “break for funeral.” The West Florissant Avenue commercial corridor was also devoid of protesters, whose ranks have typically swelled as days turned to nights. Brown was unarmed when he was shot on 9 August by officer Darren Wilson. A grand jury is considering evidence in the case, and a federal investigation is also underway. Monday also marks the first day back at school for students in the Ferguson-Florissant School District. Classes were scheduled to begin 14 August but postponed due to safety concerns. 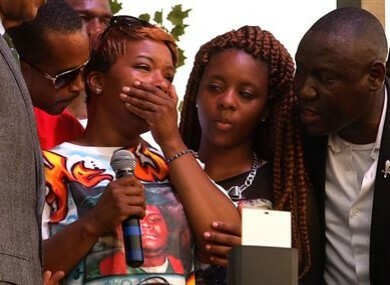 Email “Mourners throng church in St. Louis for funeral of slain teen Michael Brown”. Feedback on “Mourners throng church in St. Louis for funeral of slain teen Michael Brown”.